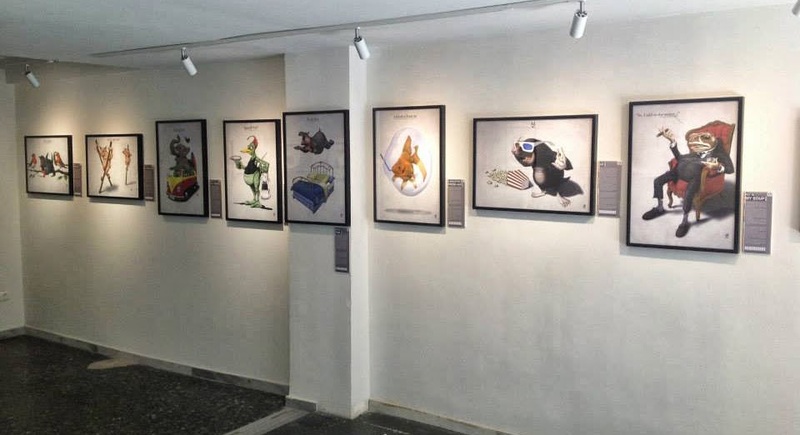 One of the things I put on my ‘bucket list’ some years back, was to hold my own exhibition. This was an addition to the list since I became confident at drawing, and also, after many visits to the great museums in London; like the Tate, National Portrait gallery, the V&A. 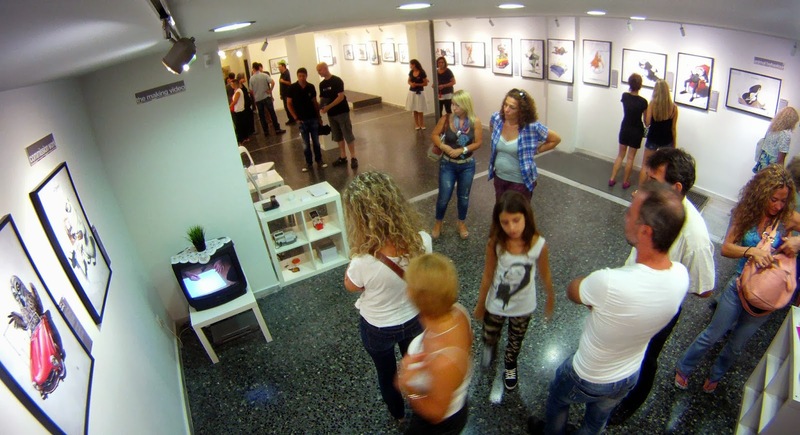 So when I moved to Greece and started visiting friends exhibitions, the idea started to grew again. It wasn’t until I began doing my Animal Behaviour collection that the notion really cemented itself. This was promoted also by helping out a friend during his exhibition, some years previously. One of the things that has held me back for so long as the finding of a good location. Many of the galleries in the town I live (Salonika) are either in upper floor housing, or basement areas of high rises. I felt it was essential for the casual passer-by should be able to glimpse my art through the window, and be drawn in. By chance I came across a colleague’s artspace, on visiting a photographic experiment. As you can see from the picture, the artspace was large, bright inside and openly visible to people as they ambled down the road. 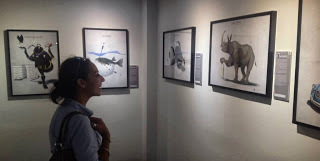 I made an inquiry during the event, and was considering the details, when the guys at ‘The Untapped Source” asked me to do several illustrations of them in animal form. In the same style as my “Animal Behaviour” series. In return they were willing to print out all my artworks for the exhibition in large format. So, the plan was set. After some meetings, it was set that September would be the best time and near mid-September. This then created a deadline for me, as I still had three images to complete and a fourth to redo. By chance everything was finalised and the images were despatched from the USA. So, all the images were piled into a friend’s car and the on tuesday, 10th September we both drove down to the gallery to begin the set-up of the exhibition at the gallery. I am not one for fate, karma, superstition, etc, and casually joked about setting the opening night date on friday, 13th, but some twists of fate took hold. Several weeks before I accidentally broke my little toe, and also at roughly the same time, pulled a set of muscles in my left shoulder. It was almost unbearable to work, walk, or use the computer. But as luck has it on the day of setting up, I managed to feel some relief, and I was there, tapping away, and completing the work in two hours. 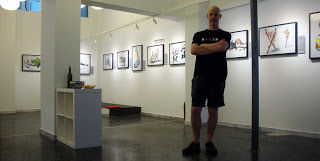 The exhibition date arrived and many a person honoured me with their presence at the opening night festivities. With some light rain and a political speech in the city centre, many didn’t risk the trip to the gallery, but it was a good night. Understanding the process of exhibitions a little, I knew that it would be a good marker to see the popularity in purchases based on the opening night. By the end of the evening the sold total was five images. Many of these were the smaller framed size. So the exhibition began! The first few days were slow, with a hand full of visitors passing through the door. Even though the comments were all good and people showed liking to the concept, the cash was not passing hands. One reason was the weather factor. The early days of the exhibition were cooler and had some rain, so people stayed in and had no urge to go into town. Then the weather broke and the sun returned. And by the end of the first week the numbers were rising, as well were sales. To help everything along, a friend of mine, who works in a local TV station, invited me onto there chat show and help advertise the event. Another great factor was the councils desire to close the centre to traffic on the middle Sunday. So, the gallery decided to open, and I spent the whole day there. This proved to be a good turning point, as the exhibition was extended, as well as a greater improvement in the sales. As the week drew to a close, the visitors became steady, and so a little event took place on the last day, where I offered a print as a prize. Wine flowed and so did the chat and people coming in. Many a friend came by and signed the visitor’s book, which touched me with their kind words. One thing which occurred, as I spent almost every day down at the gallery, was a creative discussion about future projects, and how to help the gallery process. 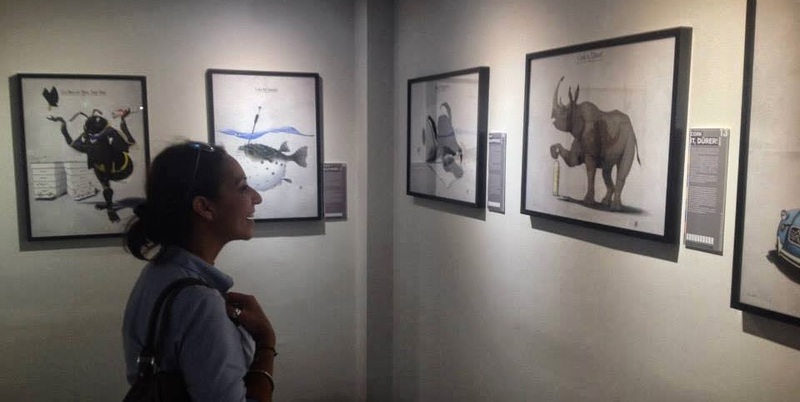 So, as the closing moments came, my mind turned to the new beginning of new drawings and what would be future exhibitions and many a new piece of art. All in all, the experience was a gigantic roller-coaster. It seemed to typify the aspects of an artist’s nature. 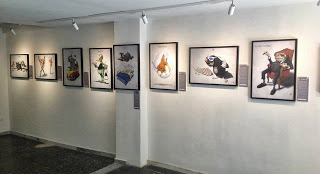 My own nature seemed to strive for perfection, which seems evident in my art, but at the same time wanting to see a consistency in the daily process of the exhibition. There are slow times and there are fun times, and there are those moments that touch you in a way that you can’t even describe here. I am very happy that I met and found new friends as well as laughed with old. I am glad I took the risk of doing this event. It has shown me possibilities I never new could arise from such things. New horizons, new adventures, and new prospects. Would I recommend upcoming artists to hold an exhibition? I would indeed. It has changed my life in a way, that has made me see that art (as I began) with tactic materials has a greater and deeper value, not only in quality, but in the social interaction. People must visit galleries and look at art. They must open their mind and allow the passion that is the artist’s vision entertain then, educate them, anger them, bring tears to their eyes, through both laughter and joy! Art is an essential part of our human and animal behaviour; we must not loose it!! A final big thanks to the people at Ro Artspace and the guys and both The Untapped Source and CCG Printing for their amazing work and effort.